Toronto, October 17, 2017 – Monarca Minerals Inc. (TSXV:MMN) (“Monarca” or the “Company”) is currently re-analyzing geological information and the re-logging historical drill results. Drilling completed in 2005 and 2008 only reached relatively shallow depths of approximately 150 meters. To date Monarca has identified 3 extremely high grade intercepts at both Los Mantos and Cerro Prieto portions of Tejamen. Drill hole MMT-141, Los Mantos, reported an 80-meter zone containing 417 grams of silver including 4,028 grams per silver from 82 to 88 meters from surface. This is one of three high grade veins identified in Los Mantos. Cerro Prieto is a thick zone of parallel veins and disseminated silver mineralization at approximately 80 meters. Cerro Prieto drilling reached a maximum depth of 150 meters. It is worthwhile to note that the core was not assayed for any other metals. Analysing the geology in the context of historical district mines suggest that the high grade feeder veins strike to the southwest for approximately 1 kilometer as depicted below. Field verification of the vein extensions is expected to be completed when surface access and permits have been secured. 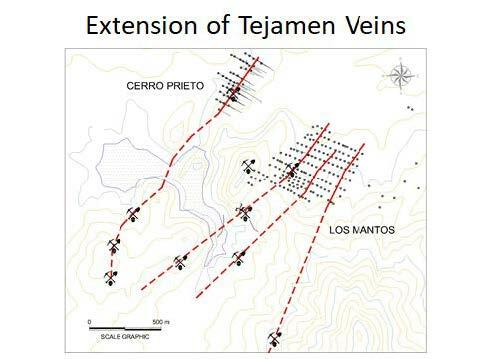 Combined with depth extension of the high-grade feeder veins, Monarca is excited about the exploration potential at the Tejamen Project. Tejamen has a 43-101 compliant Inferred Resource of 28.7 million troy ounces of silver (15 grams per ton cutoff), at a grade of 45 grams per ton silver, contained in 19.8 million tonnes. The resource estimate was prepared by Gustavson Associates and reported in February of 2016. Upper portions of the high-grade feeder veins manifest in the resource and appear to extend below to unknown depths. “We are excited to be moving forward with Tejamen, by developing future drilling plans to test high grade mineral potential. When surface access is obtained we will be well positioned to commence drilling” stated Carlos Espinosa, President of Monarca Minerals Inc. “We plan a very active year to advance and further define the resource potential within our projects”. Interim Chief Executive Officer Monarca Minerals Inc.